Founded in 1784, Friends School of Baltimore provides a coeducational, college preparatory program guided by the Quaker values of truth, equality, simplicity, community and peaceful resolution of conflict. By setting high standards of excellence for a diverse and caring community, Friends seeks to develop in each student the spiritual, intellectual, physical and creative strengths to make a positive contribution to the world. Recognizing that there is that of God in each person, the School strives in all its programs, policies and affairs to be an institution that exemplifies the ideals of the Religious Society of Friends. At Friends, we work together to build and sustain a community that is inclusive, respectful, and supportive of all people; we value diversity and cherish differences. Dedication to simplicity, peace, integrity, community, equality, and stewardship permeates every aspect of Friends School life. Regular Meeting for Worship strengthens and deepens our commitment to these Quaker testimonies. Active practice of these principles nurtures empathy and fosters a sense of responsibility to the needs of others. Structured opportunities for service help students live the Quaker testimonies at school and in the broader community. Friends is a coeducational college preparatory school offering a Pre-K to 12 program comprised of 855 students, that promotes in each student internal motivation, diligence, a passion for learning, and a strong desire to excel. The school is therefore most effective for students who can thrive in an enriched and challenging environment. Friends School cultivates the intellectual, emotional, social, physical, artistic, and spiritual development of the students. Our program balances academics, athletics, and the arts. Quaker education is a pilgrimage–a continual seeking after Truth. The search for truth requires a willingness to listen openly to the ideas of others, even in fields of controversy. Friends School believes that through self-awareness, growth, and service to others, that of God in each person is made manifest. The Friends School Maker Space is defined by its fluidity and interchangeability. The functionality of the space is intentionally not set or fixed. It is not a wood shop, garage, science lab, nor art studio but rather, it is ALL of those things. The space is a physical manifestation of the school’s Teaching and Learning Paradigm which is the pedagogical and curricular framework for the school. The 3 spheres of this paradigm, Knowledge, Skills, and Habits of Mind, work interchangeably in the design and delivery of the learning experiences at all levels of the school. Curiosity, Creativity, Empathy, Reflection, and Resilience are the foundational habits of mind of the Teaching and Learning Paradigm and are among the habits that students cultivate and develop in our Maker Space. Previous all-faculty summer reads also inspired the building and design of the space and the programs and activities that happen there. Shop Class as Soul Craft by Matthew Crawford and Creating Innovators by Tony Wagner emphasize the crucial importance of learning by doing, “tinkering,” designing, building, modeling, experimenting, playing as experiences that help young people foster and deepen their creativity. The Maker Space is also not “owned” by any single teacher or department. There is an egalitarian, “open-to-all” atmosphere to the space: students are free to work on projects during free periods and before/after school or on weekends. For example, It is not uncommon for the space to be humming with boisterous and exuberant activity on a Friday night with Robotics team members prepping for their upcoming qualifying tournament. There are several Upper School courses and clubs that meet in the space. 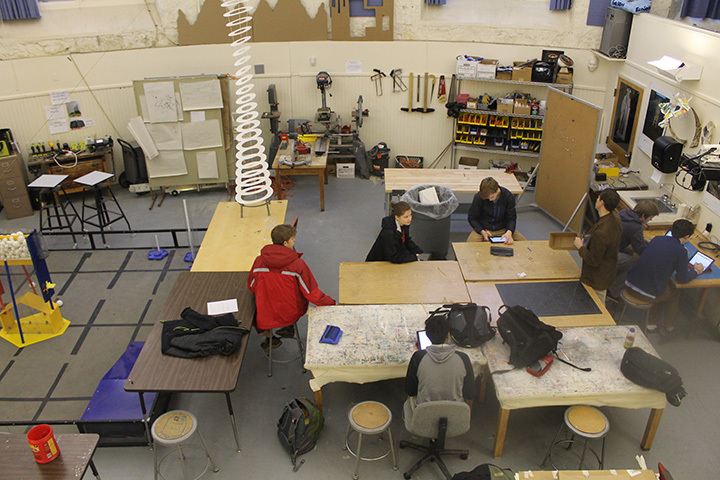 Students and teachers of Sculpture, Automotive Physics, Motion (Kinetic Sculpture), Vespa Restoration Club, and Robotics Club are the primary users of the space. Our forays into creating a maker space have been organic and evolving. The design of the space and the activities which happen there have not been directed by any one person, department, or administrator. Similarly, the space has no capitalized budget or funding source. Rather, it has continued to grow and expand through the passion and interest of several members of the faculty. Glass wall on the mezzanine to protect the library books from dust, etc.